We give you access to the good stuff – real New England hard shell lobsters shipped overnight to your door, in any season. Mail order Lobster? You bet! Everything you need for a lobster feast for six, including claw crackers, bibs, and cooking instructions, is included in our kits. Are you craving fresh lobster? 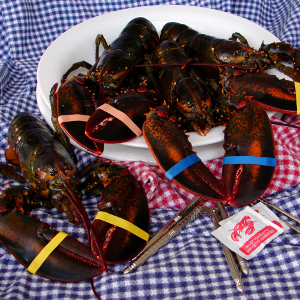 Buy lobster online from Woodman’s of Essex. We give you access to the good stuff – real New England hard shell lobsters shipped overnight to your door, in any season. Mail order Lobster? You bet! Everything you need for a lobster feast for six, including claw crackers, bibs, and cooking instructions, is included in our kits. Woodman’s has earned the reputation of being one of New England’s premiere seafood specialists because of our commitment not only to quality, but also our commitment to sharing the amazing taste of New England seafood with seafood lovers all over the country.